It happens. It’s a bummer, but, it happens. Occasionally, you need to return money you have received from a customer and you need to record it in QuickBooks Online. If a customer returns merchandise to you, issue a credit memo. Alternatively, if you need to refund money to a customer — perhaps because goods arrived damaged and the customer doesn’t want to reorder them — issue a refund receipt. If a customer returns goods previously purchased or if you and your customer agree that the customer’s outstanding or future balance should be reduced, record a credit memo in QBO. 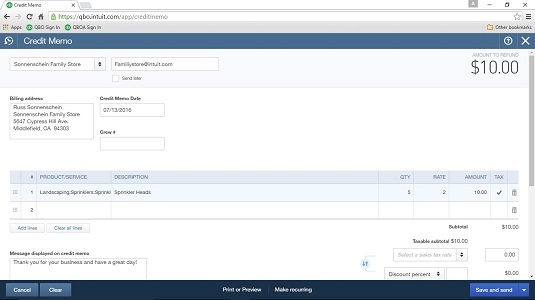 By default, QBO automatically applies credit memos to outstanding or future invoices. If you want to change that behavior, open the Account and Settings dialog box (choose Gear menu → Account and Settings) and click Advanced on the left. Scroll down to the Automation section on the right, and click the Automatically Apply Credits option. You enter a Credit Memo transaction pretty much the same way you enter an invoice; to display the Credit Memo window, you can click the Create menu button and choose Credit Memo or, from the Sales Transactions page, you can click the New Transaction button and choose Credit Memo. Select the customer, fill in the products or services for which you are issuing a credit memo, fill in the bottom of the Credit Memo window with appropriate information, and save the transaction. 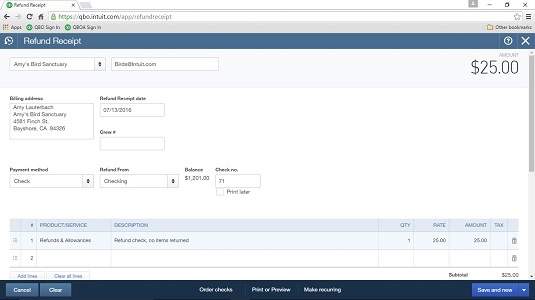 This transaction window is very similar to the Invoice transaction window..
You can enter a credit memo for a customer even if that customer currently has no outstanding invoices; when you enter the customer’s next invoice, QBO will apply the credit memo to the invoice. When you enter a credit memo for a customer who has outstanding invoices, QBO applies the credit memo to an outstanding invoice; if you view the Sales Transactions list for that particular invoice, you’ll notice that its Status is Partial, meaning that the invoice is partially paid. Use QBO’s Refund Receipt transaction if you need to refund money to a customer instead of reducing an outstanding or future balance. In this example, a refund check is going to be issued to a customer, which will deduct the amount of the refund from a Bank account and reduce an Income account. The customer didn’t return any items. To account for refunds you issue when a customer doesn’t return an item, first set up an account called something like Returns and Allowances and assign this account to the Category Type of Income and a Detail Type of Discounts/Refunds Given. Then set up a service on the Products and Services list and call it something like Customer Refunds or even Returns & Allowances. Do not select Is Taxable for the service. Assign the service to the Returns and Allowances account and don’t assign a default Price/Rate. Filling in the Refund Receipt window is very similar to filling in the Invoice window. To display the Refund Receipt window, click the Create button — the plus (+) sign — and choose Refund Receipt in the Customers column. Select a customer, and QBO fills in related customer information. Select a payment method and an account; if you select a Bank account, QBO lists the Bank account’s current balance and the next check number associated with the account. If you want, click the Print Later check box. In the example, the customer isn’t returning any items, so the Refunds & Allowances service was selected. If your customer is returning items, select the item in the Product/Service column that the customer is returning in exchange for the refund and don’t select the Refunds and Allowances service. You can scroll down to the bottom of the Refund Receipt transaction window and fill in all the same information available at the bottom of an invoice.